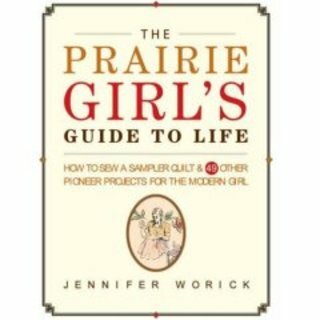 I bought The Prairie Girl's Guide to Life on Amazon along with The Daring Book for Girls and the Dangerous Book for Boys. I bought these books for nieces, a nephew, and Aidan. I also received a George Winston piano book and an Old School Sesame Street DVD (which I hear Aidan laughing at right now- score!). I'm happy Aidan likes the DVD, which I couldn't hang on to for Christmas for reasons that attack me every time I buy gifts early. He wasn't nuts about the Electric Company DVD I bought earlier but I was thrilled with it. Back to the books. I love those Daring and Dangerous books--A LOT. However, The Prairie Girl's... book, while really cool, is geared to much older girls. Like maybe 30-somethings and up. This book is up for grabs. All you have to do is type in the comments about what your interests were as a little girl. I will draw a name somehow on Friday. I'll start: As a little girl, I adored my mom. Still do! I faked being sick so I could be home with my mommy. I loved playing with baby dolls, playing school, playing barbies, playing tag, dreaming under the pear tree, doing gymnastics on the lawn, bike riding, making May day baskets for the neighbors, hiding out in the tree house my dad made, baking and crafting with my mom, dressing my cats in baby doll clothes, making clothes for my stuffed squirrel, and roller skating. Mom - is there anything else you can think of? well i can comment, since you asked, even if i don't get in the drawing. oddly, when i was a little girl, i was very into "the prairie", i didn't watch the little house tv show, but i read all the books and i liked to go outside and build little houses and run the hose to make a fake stream so i could wash my doll clothes. i even collected acorns in case i had to make some acorn bread during the blizzard! i also loved building fairy houses and finding little nooks that fairies might live in. and i read a lot. and drew. and cooked. and rode my bike. Man, I remember the cardboard store! I also remember playing Barbies for DAYS where we would only leave to eat and come back afterwards. Barbie was always a model-how else was she to wear all of those clothes! Don't forget the Playschool LIttle People "world" where our brother would make a "treasure map" and burn the edges authentically. He then pulled the rhinestones out of all the vintage jewelry (egads! )and made a treasure chest out of Legos. Of course, once the treasure was found, our "world" had a huge tornado or earthquake and toys would be everywhere! Ahh...the good old days! My big thing as a child was to do everything Shirley Temple did. I had a Shirley coloring book and I tried to emulate every single page with whatever activity good ol' Shirley was doing. If Shirley was ironing, then I had to have my own little ironing board and iron--and so on. I'm I suspect it drove my mom crazy but she was pretty good about helping me with things. To this day, I still have a fondness for Shirley Temple. You forgot the cardboard store!! The swimming pool! Playing with your turtle in the screened in porch. Playing games and making tents on the porch. Playing house with Duchess. Watching old movies and having a picnic in the living room for quiet time. Such sweet memories. You are also making these same type of memories for our Aida! I'd love it! When I was a little girl I loved to read and craft. I think I probably dabbled in every craft there was when I was little. I seemed to have tried it all! Candles, sewing, painting, etc. Well, let's see. I loved Barbie dolls - I would make them some hand-stitched clothes, pose\arrange things in the Barbie dream house, dress them up. I also liked roller skating (loved those roller rink parties), drawing (I still love the smell of new crayons), video games (we even had Pong when it first came out), and gymnastics. On the whole dress up thing - I used to dress up my dog and then take photos, poor thing!